Hamsters are the literal worst. OMG. She begged for dwarf robo-hamsters, because she had seen them on youtube. Her other pets had just died horrible deaths (details later in this list), so we felt inclined to give them a try. Names: Crackers and Ellie. They seemed reasonably easy to care for, and they are. We went to our local pet store and consulted with the small animal expert who warned us that this particular breed of hamster is very active, and therefore would be hard to hold and not very cuddly. We were also advised to get two of them, so they could bond and play with each other. This seemed like not that much more work so we went for it. Which was great, until I found one hamster EATING THE OTHER HAMSTER. Hamsters are cannibals. I had to clean up hamster entrails, it was very unpleasant. Scarlet cried, I gagged, life went on. Then this morning I was making my coffee at 5:30 a.m. and saw a mouse scurry across the ground. I yelped and jumped, then took a closer look and was like go****it that’s Crackers. Crackers the hamster then ran under the door into the garage where I am assuming it will live until it dies and starts to smell, at which point I will be able to find it. I did set a hamster trap on advice of a prudent mama on our Facebook page, so I will report back if it works. Also, we are now left with the amazing hamster world pictured above that we built in her room. 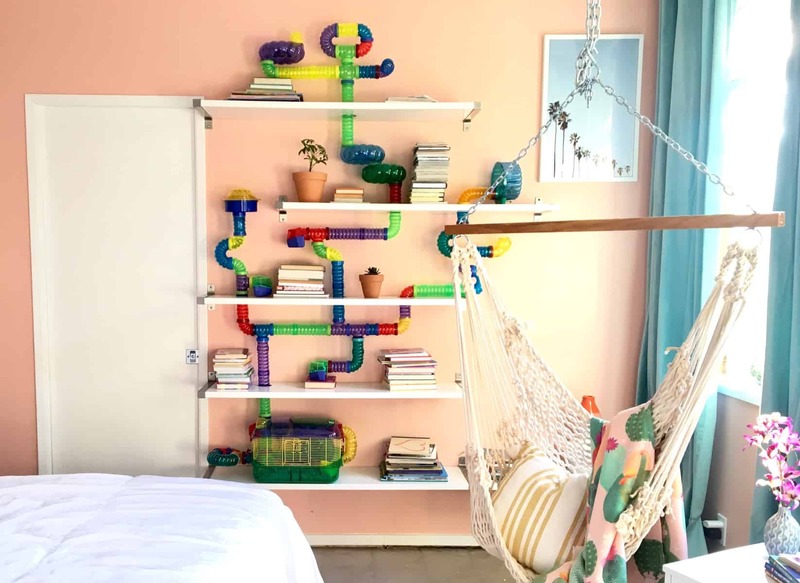 This is pretty cool but virtually impossible to clean. Kid take: Hamsters are cute but they aren’t that fun and they smell a little bad and you have to feed them and clean them and changing the water is hard. Scarlet came home from school at the end of last year with three snails. Names: Rainbow, Sugar, and Cranky. I don’t know how she determined that one of the snails was cranky. These snails were class pets, and the children did some sort of raffle to determine who got to bring what animals home. I guess I should be glad we didn’t get the crawfish? I don’t know how to care for a crawfish? I also don’t know how to care for snails. They are terribly disgusting. We had an empty aquarium so I put them in there. Within two hours it was coated in slime. I have to give them water and salad and sometimes they get stuck on the walls and Scarlet has to moisten them. One of them is surely dead but Scarlet insists it is still alive. I keep wanting to set them free in the yard, but Scarlet assures me this is akin to snail murder. 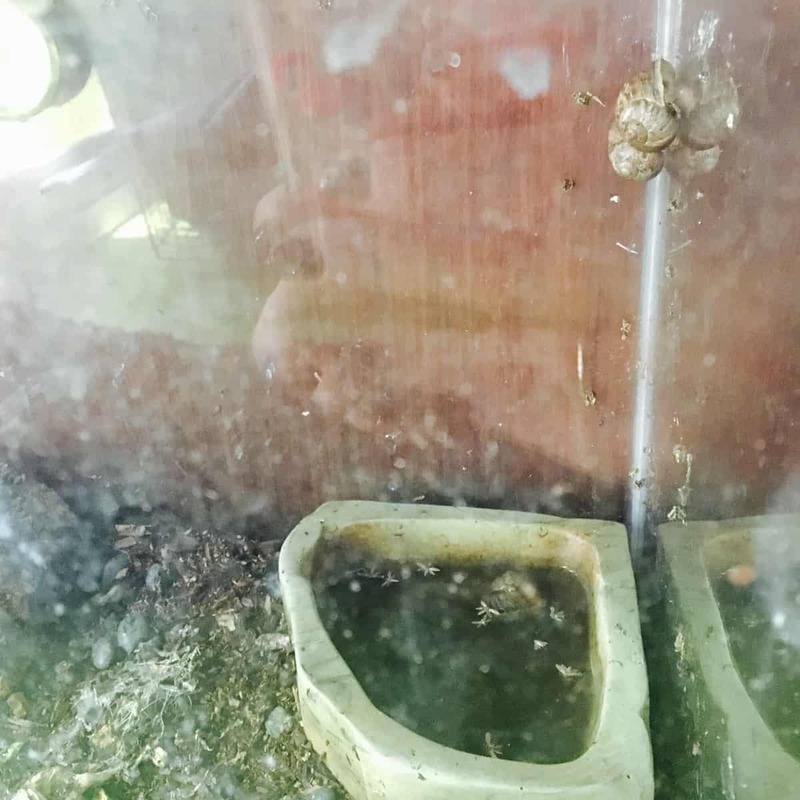 The snails are so disgusting, I had a hard time wanting to show you a picture, but this is reality people. Kid take: What’s wrong with snails? Snails are interesting. That is not our horse, that’s just a good picture of me and a horse. I love horses. When my mom died, she left me her horse. Name: Bacardi. But Scarlet was only 7 years old, and the stable was far away, and I didn’t have the space in my heart or time in my day to take care of this horse the way a horse needs to be taken care of. 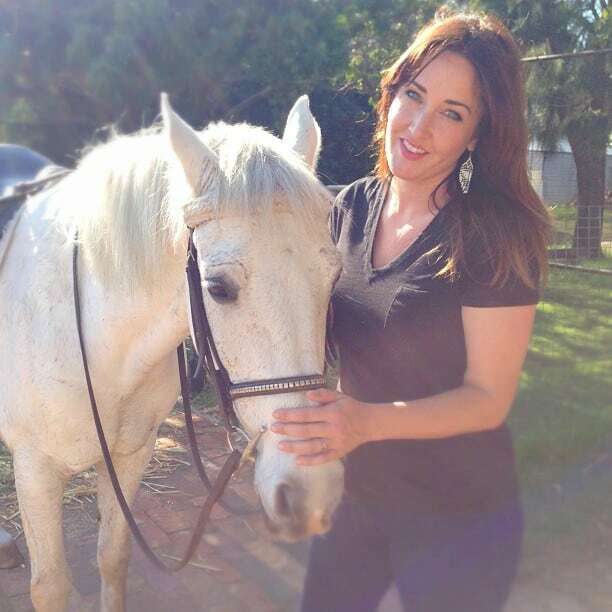 Scarlet wanted the horse, but we weren’t in a place where we could become horsewomen, so I gave the horse to the stable, where it is now used for lessons and is well provided for. Of course, now, two years later, Scarlet is taking horseback riding lessons and wishes she had a horse of her own. All in all, I think horses are amazing tools for teaching children responsibility, but they are entirely too expensive (at least in the city) and time consuming to make my list of top pets. They do, however, outrank snails and hamsters. I would rather spend all of my money in perpetuity on a horse then get another hamster. Kid take: Why did you give away my horse? Chickens are pretty great. I adored our chickens. Names: Queen Singalong Ice Cream, Love Traveler, Lemon, Zebra, Fluffy, Marble, and Pippi. But they come with issues when you live in the city, the biggest one being that they attract rodents. So we had a rat problem that took some creative trap setting to solve. Then we moved to a new house, still in the city but in an area with more animals, namely possums, raccoons and the occasional coyote. These animals want nothing more than to eat your chickens. I don’t know what animal it was that broke into our coop and disemboweled two of our seven chickens, but it was very unpleasant. We aren’t vegetarians, but these particular chickens were our pets and to fish one of their heads out of our pool and gather their bloody wings into bags was awful. We ended up realizing the rest of our chickens weren’t safe, so we sent the last five to a rescue farm (this is a real thing: Farm Sanctuary), where they are living out the rest of their lives in peace. We even went to visit them on the Northern California farm last November, and they remembered us (pictures from our visit to the farm here)! We miss them, but know that they are better off. 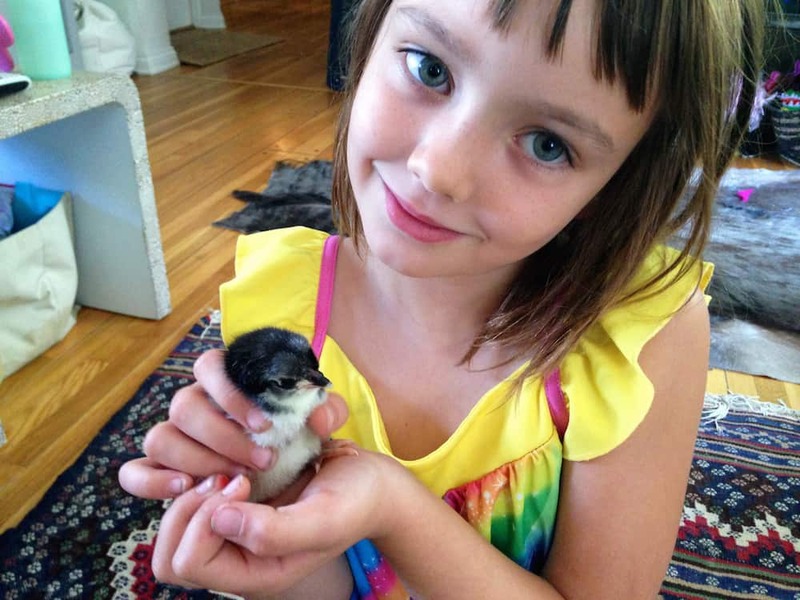 The very best part of our three years of chicken ownership was hatching a chick ourselves, which we will never forget. Chickens are a lot of work, however, they are the only pet that gives you something you can use, which is eggs. I miss their eggs the most. 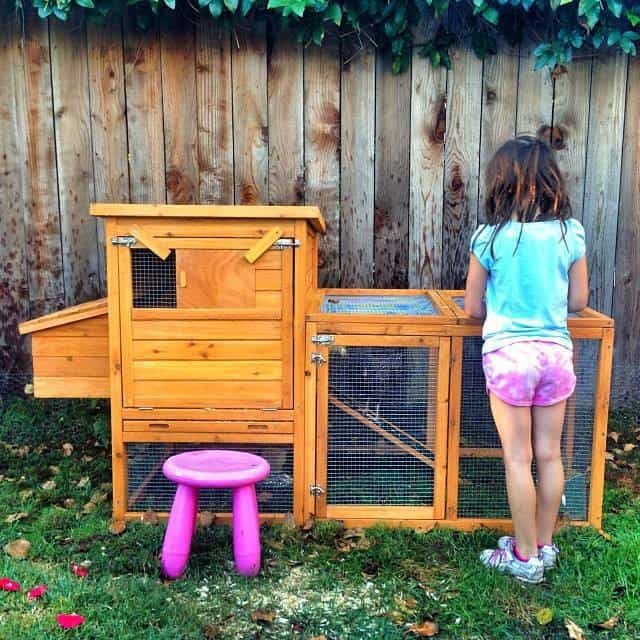 Kid take: I miss my chickens a lot, but they are happier on a farm. We had a cat. 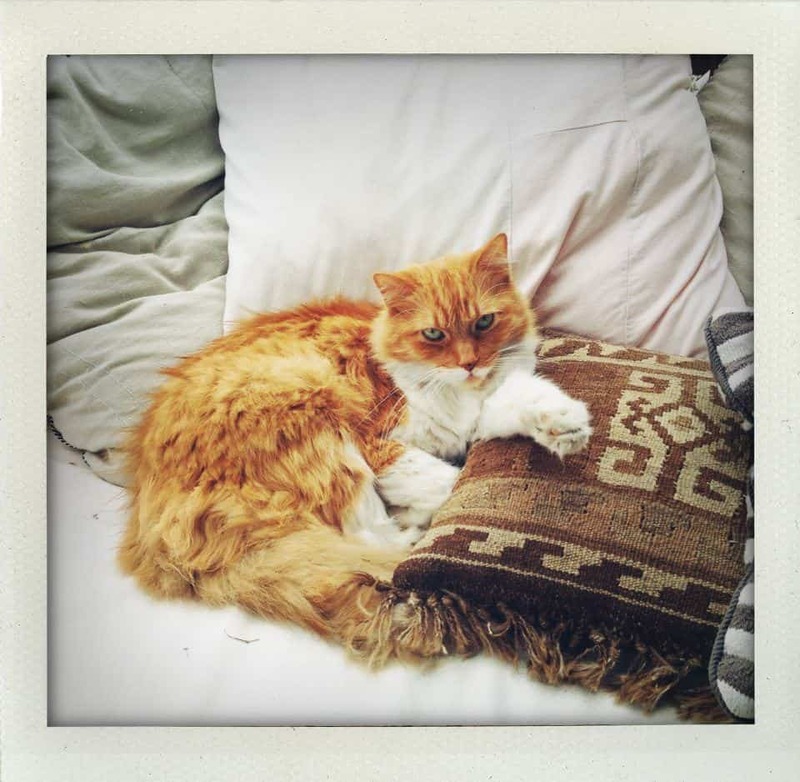 He was a good cat, as far as cats go. I found him in a basement and took him to the vet, and the vet was like, this kitten will probably die in a shelter if you don’t take it, so I did. It was orange and cute. Name: Hammy. I know some people are really into cats (ahem, Jacinda), but for me the scratched-up furniture, horrible pee smell, lack of cuddliness, and general spreading of hair onto all of my belongings just make me not that into them. I know this is controversial. I am glad you love your cat. I loved my cat too, but I am not rushing to get another one. Scarlet is asking for another kitten, sometimes I consider it (they are so cute), but then I think about all the afore-mentioned things, and the number of other pets we already have, and I decline. But if another cat should find me, like my first one did, I would call it fate and take it in. Scarlet decided that she wanted a fish more than anything on this earth. We felt we had enough pets, but I am pretty down with animals so I told her I would think about it. 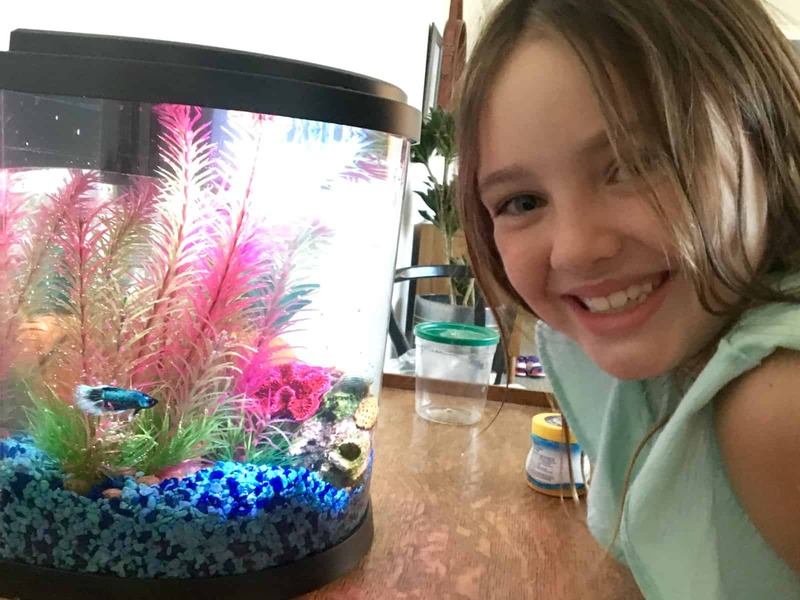 I made it clear that if we did get a fish would be HER fish not MY fish, and I was concerned that she didn’t know enough about caring for a fish and wouldn’t be responsible for it. Cut to three days later, when she puts me in my place by sitting me down and presenting me with a homemade 9-page research document detailing the intricacies of fish-ownership and declaring that she could and would take responsibility for her fish. She also declared that she would pay for the fish and all of its equipment from her own savings. How could I say no? So off to the fish store we went, and came home with a beautiful beta fish. Name: Gemma. It’s a pretty gorgeous fish. They make all sorts of great filtered beta tanks now that don’t need to be emptied and cleaned on a weekly basis, and light up with LED colored light shows and the like. Gemma’s tank got some algae in it, so we got a pleco to eat the algae. That died within two days (I think it had ick from the fish store), so we replaced it with a few zebra and tiger snails. They ate all the algae, but then they were hungry so now we have to give them algae disks a couple of times a week. But all in all, the fish has been fun to have, doesn’t smell, doesn’t run away, doesn’t attract pests, and is very relaxing to look at. Most importantly, Scarlet has taken care of her fish pretty much on her own, which is a win for responsibility. All in all the fish experiment has been a winner. Kid take: Fish are so pretty and relaxing to watch. They aren’t super fun but they’re really neat. We have a box turtle. Name: Pickle. I gave this turtle to my husband on his 30th birthday. My husband is now 41. This turtle will probably outlive us, and Scarlet is already talking about how her future children will love him. He’s awesome. 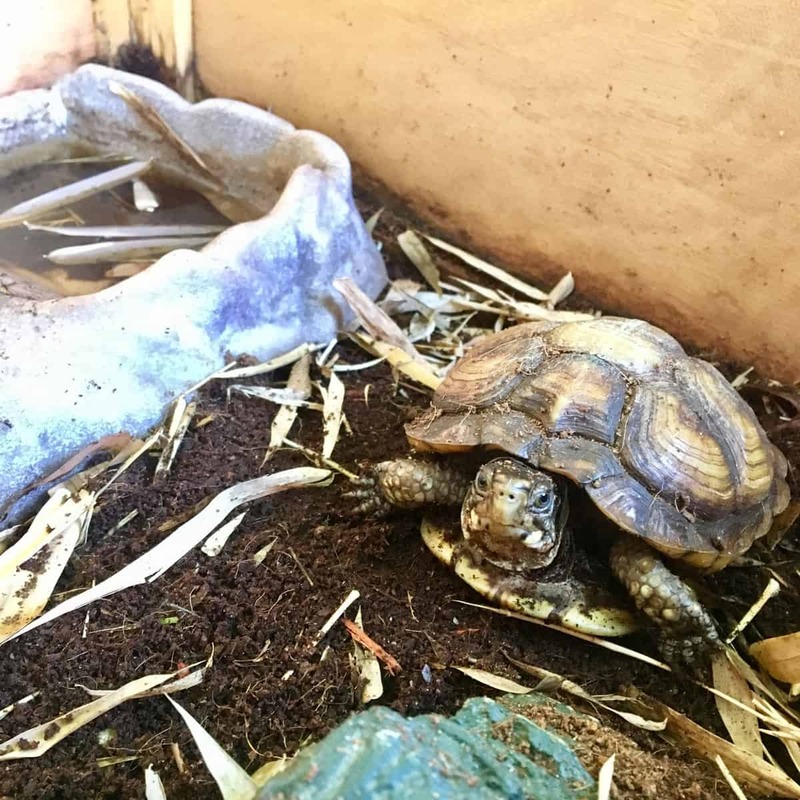 He lives in a tortoise house outdoors, he eats salad and live worms, and he digs little holes and stares up at us. He doesn’t really like to play too much, but he’ll run about and entertain us with his worm eating. He only needs to eat once a week or so, so we can go on vacation without requiring a turtle sitter. He doesn’t smell, he doesn’t ruin anything, and he’s pretty adorable. He’s about doubled in size in 11 years, but is still small and cute. We love pickle. Turtles get a 98% in my book as kid pets, they are easy to care for, teach responsibility, and are fun to interact with. But they don’t snuggle, so minus 2%. Kid take: Turtles are awesome! They aren’t very cuddly but they are still cute. Dogs are the world’s best pets, hands down. They make messes and bark and all kinds of stuff, but it’s all worth it for the love and snuggles and friendship. My dog died when Scarlet was four. We were devastated. After about 9 months of mourning, we decided we were ready for a new dog. We went to the West LA animal shelter and told Scarlet she could pick any dog she wanted. She found this little cutie and fell in love. This dog had mange and pneumonia, but a few vet visits and she was all fixed up. Name: Princess Cheese. P Cheese is a delight. She has a job, which is to wake Scarlet up for school every morning. She does it well, with jumps and licks and snuggles. 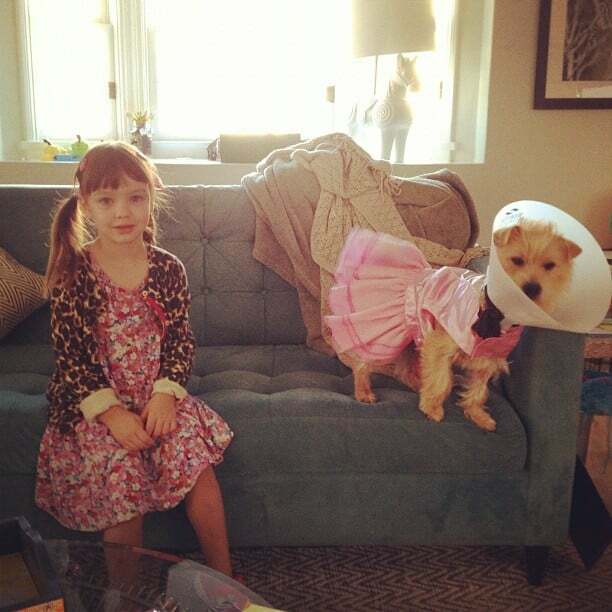 She is a friend to Scarlet, and puts up with a lot of shenanigans, like games of dress up. Dogs require the most work of all the pets, but are 100% without a doubt the most rewarding. She doesn’t make eggs, just poops we have to clean, but she makes us smile every. single. day. Dogs are love made real. 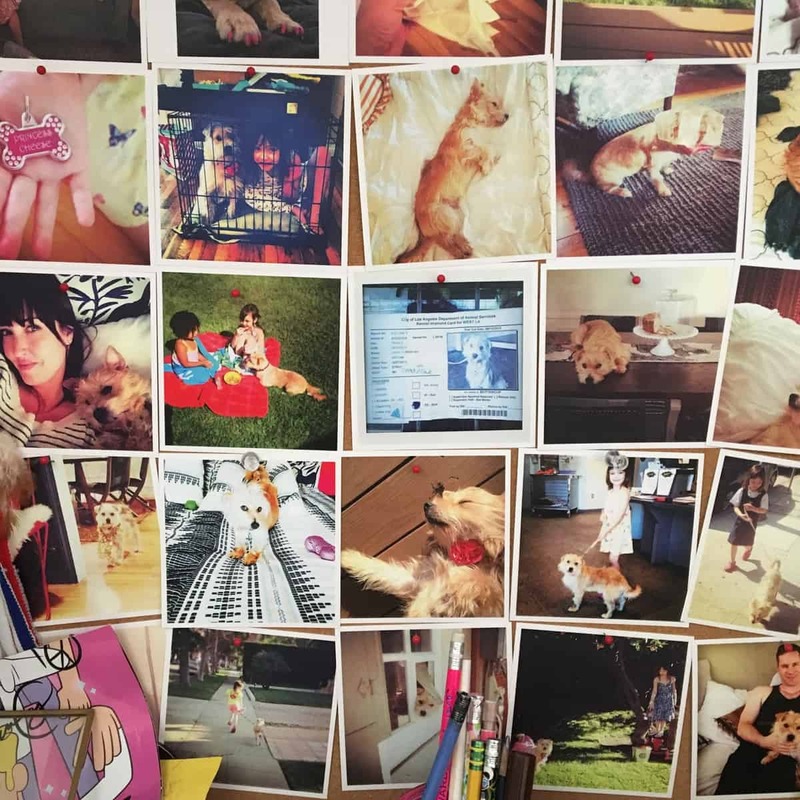 DOGS FOREVER. Pretty much says it all. Think I’m nuts? Love snails? Think every kid should have a hamster (seriously doubt this, like 85% of the people I know have a hamster cannibalism tale to tell)? Is there an amazing pet we haven’t tried yet? Do we need a parakeet or a chameleon? Let me have it in the comments. I would give guinea pigs a try! I also had fishes, turtles, dogs and a parakeet. My parakeet was really cool, he learnt to say my name, and he took his tail out of the cage so I could scratch him 🙂 He lived many years, didn’t make much noise, but needed constant poop cleaning or else the cage got smelly… His name was Pinky, I don’t really know how I picked his name since I’m Spanish and it doesn’t mean anything in my language. 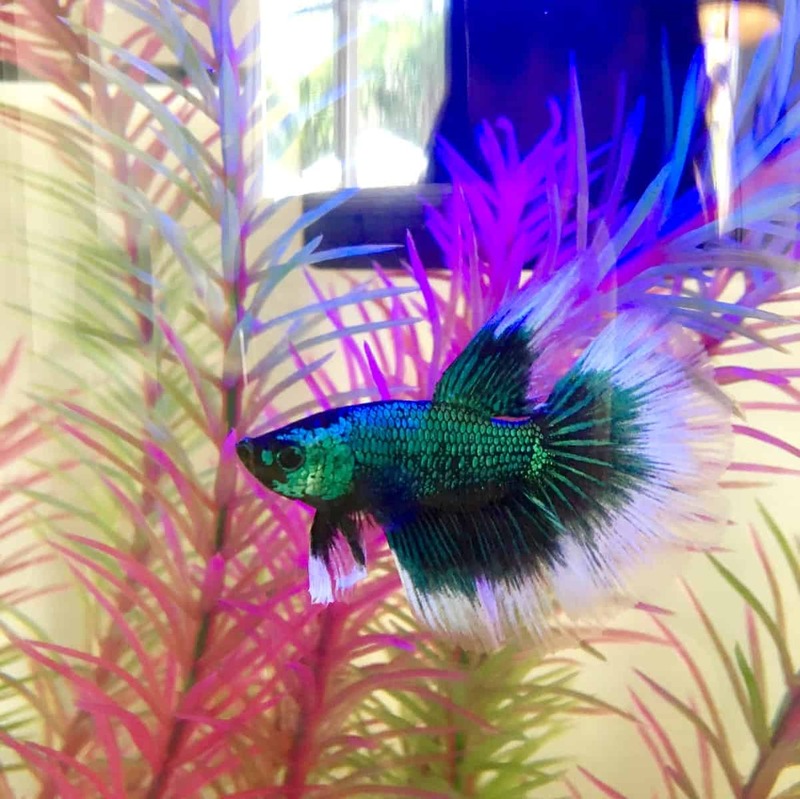 My daughter is 3yo and has been asking for a pet since her birthday. She knows about my problem, my in-laws had a cat many years who died 5 this year and she has seen how bad I felt when the cat was around. We agreed that we’ll have a small turtle when she turns 4 (the kind that you have in a terrarium). Do you think it’s a good age to take care of this pet? I think by 4 she will be able to help us feeding and cleaning it. I like your list! But in my mind you missed one. Now it’s a tricky pet, really hard to sell to in-laws, visitors, or anyone really, but for us, they are the BEST. Rats. Back story… we can’t have a dog, or a cat or anything big-ish thing that has fur, really. My husband, and now son and daughter, are allergic. Hypo-allergenic does not work, trust me. But rats are awesome. (once you get over the tails) They are very smart, cuddly(they love to be held) and have tons of personality – and are extremely social. They want to play! They love to learn and to eat leftovers and will greet you in the morning. It’s not fun to clean the cage, but when is picking up poop fun? Never.